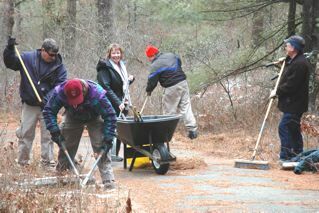 Friends help keep bike trails clear of debris. Friends helped build the Amphitheater in 2008. The Friends of Myles Standish SF Hiking Meetup Group! 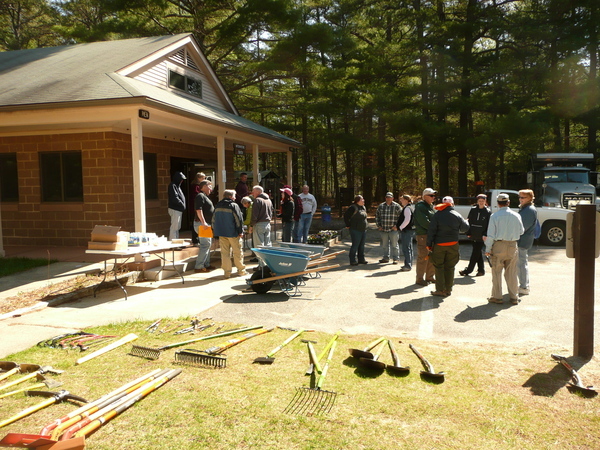 Friends of Myles Standish State Forest (FMSSF) is organized to promote and conserve the natural, scenic and historical resources of Myles Standish State Forest and its Satellite Areas; to foster the use and enjoyment of Myles Standish State Forest by the public in a manner consonant with the protection and preservation of the environment; to engage in such educational, scientific and charitable activities as will assist the Commonwealth of Massachusetts in the operation of Myles Standish State Forest; and to assist and work in cooperation with the Forest Supervisor in general support and enrichment of Myles Standish State Forest. 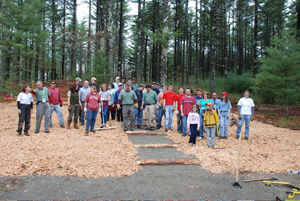 Friends of Myles Standish is directed by a Board of Directors representing the various Forest user groups. Members and the public are welcome to attend the board meetings. Meetings are held on the first Wednesday of the month at the headquarters conference building (100 yards up the street), 194 Cranberry Road, Carver, at 7:00 p.m.
FMSSF History Section - How did we get here?